In case of water damage, what should you do? An agent from the claims centre answers this real-life question. Response by Richard, Claims Centre Agent: First, you need to turn off the water supply connected to the washing machine, in order to help stop the flooding. Afterwards, move items that are easily moveable in order to salvage what you can (e.g. furniture or electronics), followed by mopping up as much water as you can. Then air out any affected rooms. It is vital, however, to lower the heat in affected rooms to help keep the home cool to inhibit mold growth. Therefore, we recommend that you use fans. You should then contact us to start your claim. An emergency team will be sent to your house to handle the drying process. To avoid this situation, it’s best never to leave your washing machine running in your absence. To prevent water damage, you should also check the washing machine and dishwasher hoses regularly (or have a professional do it if there is no easy access). To recap: Avoid potential damage by not leaving equipment unattended and inspect appliances regularly. In the event of a leak, minimize damage by moving your belongings, mopping up the water and airing out the space. Have another question for our claims agents? You can send it to us in a private message through our Facebook page! 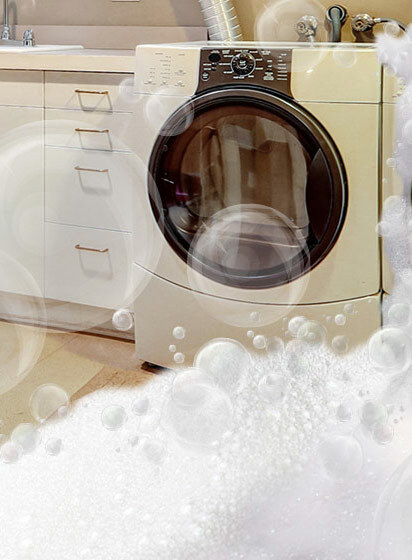 *The image used for this article depicts water damage caused by a washing machine, but not the precise situation stated above.